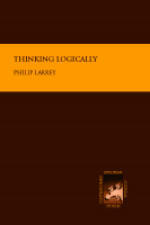 Title: Thinking Logically Author: Philip Larrey Series: Contemporary European Cultural Studies Imprint: The Davies Group, Publishers soft cover 274 pp. USD 26.00 ISBN 978-1888570977 September 2001 Professor Larrey grapples with the issue of what counts as “thinking logically,” and where such thinking leads us, through this survey of four, widely influential thinkers in the analytical tradition. Relying on works by four leading thinkers of the past 50 years, Larrey fleshes out the logical consequences of their reflection on knowledge, concluding that any knowledge that purports valid truth claims must be rooted in what can be considered common sense knowledge. Although the subject matter deals with certain technicalities of recent thought in the analytical tradition, the upshot of the arguments is rather straight-forward: even after the Copernican Revolution, Relativity Theory and Quantum Mechanics, common sense knowledge is still the necessary foundation for all subsequent speculation, especially where truth is concerned. Contents Introduction Chapter One — Presuppositions and other ‘commitments’: W. V. O. Quine § 1 Crucial importance of ‘what is presupposed’ § 2 Quine and the ‘utopia’ of extensionality § 3 Existence trumps Ontological Commitment § 4 Existence, Theoretical Constructs and Common Sense Chapter Two — Conceptual Schemes: Donald Davidson § 5 Historical Survey § 6 Davidson’s Critique § 7 Truth Makers § 8 Objective Truth Chapter Three — Interpretation and Common Sense: Richard Rorty § 9 After the Linguistic Turn § 10 Truth & Intersubjective Agreement § 11 Pre-philosophical Convictions Chapter Four — Realism and Reticence: Hilary Putnam § 12 Analytic and Post-Analytic Philosophy § 13 On ‘The View from Nowhere’ § 14 Internal Realism with a capital ‘R’ Conclusion § 15 Philosophy unbounded § 16 The future of Philosophy Notes Bibliography Author Philip Larrey earned his doctorate in analytical philosophy in 1994 at the Gregorian University. He teaches logic at the Pontifical Lateran University in Rome. His interests include the philosophy of science, the relationship between science and religion, and the rationality of religious belief. He is a regular contributor to the philosophical journal of the Lateran University, Aquinas, and has published several articles on the themes of truth, alethic logic and the philosophy of common sense.